In 1852 there were approximately seventy Catholic worshipers in Provincetown, most of them of Irish descent. With no easy means of transportation, and no church anywhere in the near vicinity, the Reverend Joseph Finotti periodically traveled from Boston celebrate Mass and hear confessions. Religious services would take place in the parlors of these worshipers and due to the long journey, Fr. Finotti often stayed in these homes as well. By 1854 these devout folks had raised enough money to purchase property that included a building large enough for a church and a separate room to allow lodging for the visiting priest. The building was called Snow’s Block but it didn’t last long as a church as it was quite small and the number of Catholics was growing. After several other buildings were used, property known as Parker’s Plain was purchased and construction began. This location would be permanent and was dedicated as a church by the Most Reverend Thomas F. Hendricken, Bishop of Providence, RI. The date was October 11, 1874. Ulysses S. Grant was President and Pius the IX was Pope. As St. Peter the Apostle Roman Catholic Church began to grow, it underwent a period of devoted long term priests who strengthened the foundations of the parish. Fr. Manuel C. Terra was St. Peter’s 6th pastor and served for 31 years from August of 1893 to November 1924. Fr. John Silvia followed and served from 1924 to 1951. The Provincetown High School Class of 1947 produced three graduates who would go on to the Priesthood, Fr. Manuel Ferreira, Fr. Louis J. Joseph, and Fr. Leo Murphy. In 1948 Fr. 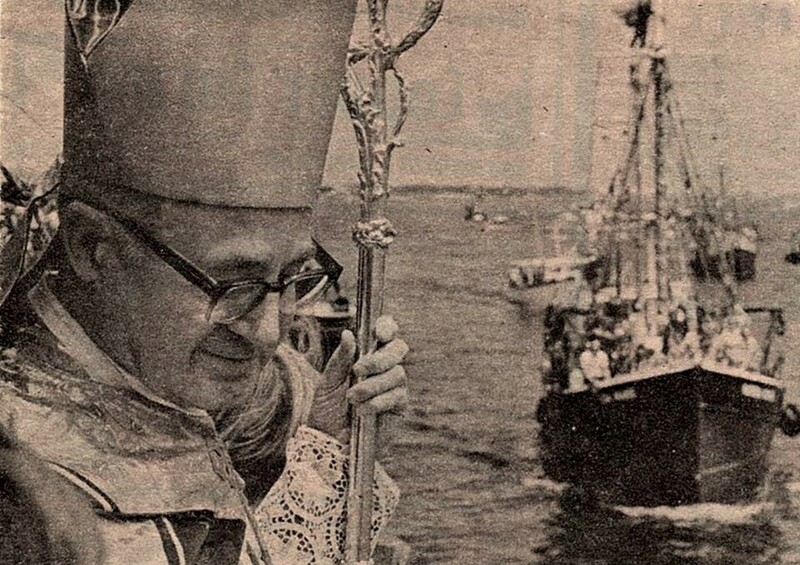 Silvia was at the side of the Most Reverend James L. Connolly as he presided over the First Annual Blessing of the Fleet. Sometime between 1920- 1924 (dates vary,) St. Peter’s faced a crisis. Residents said to have connections to the KKK burned a cross in front of the church, likely in protest of immigration, especially by the strong Portuguese community. This divisive act only made the parish stronger as members came together to support one another. Previously established but not well organized, the burning cross secured the commitment of men to strengthen and grow St. Peter’s chapter of the Knights of Columbus, which continues to support the church as well as the entire community to this day. Taking over from Fr. Silvia was one of his assistant pastors, a priest named Leo J. Duart. Fr. Duart’s name carries many memories for the people of Provincetown. Much beloved by his parishioners and the town as a whole, Fr. Duart made it his mission to rebuild and beautify the church. His greatest dream however, was opening a Catholic school in town; a dream he accomplished in the autumn of 1967. St. Peter’s School was staffed by the Sisters of the Love of God, an order dedicated to education who had previously been teaching in Cuba. Sadly, due to declining vocations and enrollment, and increasing costs, the school closed in 1971. 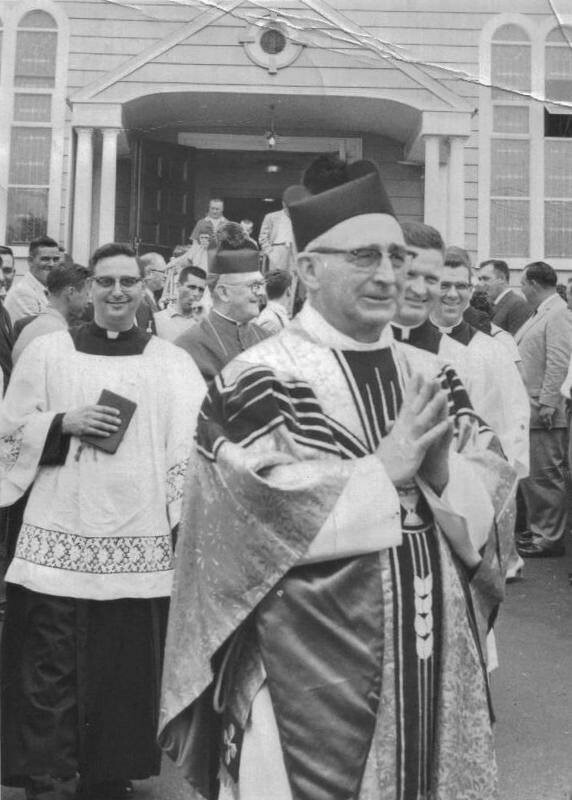 Having been granted the honorary title by Pope Paul VI in 1967, Monsignor Duart remained pastor of St. Peter’s until 1975. The church was shaken to it’s very core following a massive electrical fire that destroyed the building on January 5th, 2005, the day after a major blizzard. Due to the dedication of Provincetown’s volunteer fire department, (some of whom had to walk to the fire scene through snow drifts 3 feet high as many secondary roads were still unplowed,) and mutual aid from fire departments of several Cape towns, no one was injured. But the entire church, including the altar mural of Jesus walking on water, painted by local artist Eugene Sparks, was destroyed. By the grace of God, the tabernacle was spared. According to several firefighters who entered the building, it was as if the fire consumed everything in it’s path but died out as it neared the tabernacle. Provincetown is a faith filled, hardworking town and with support from the entire community, St. Peter’s did not miss one Mass and immediately began plans to rebuild. Under the guidance of the parish priest at the time, Fr. Henry Dahl, St. Peter’s was rebuilt. On July 13, 2008, just over 3 years following the fire, the Most Reverend George W. Coleman, Bishop of Fall River dedicated the beautiful, new St. Peter’s Church. As scripture tells us, and as the rock on the altar reminds us, Thou art Peter and upon this rock I will build my church (Matthew 16:18) with love of God, and love of neighbor, you can build a foundation of faith to be cherished forever.